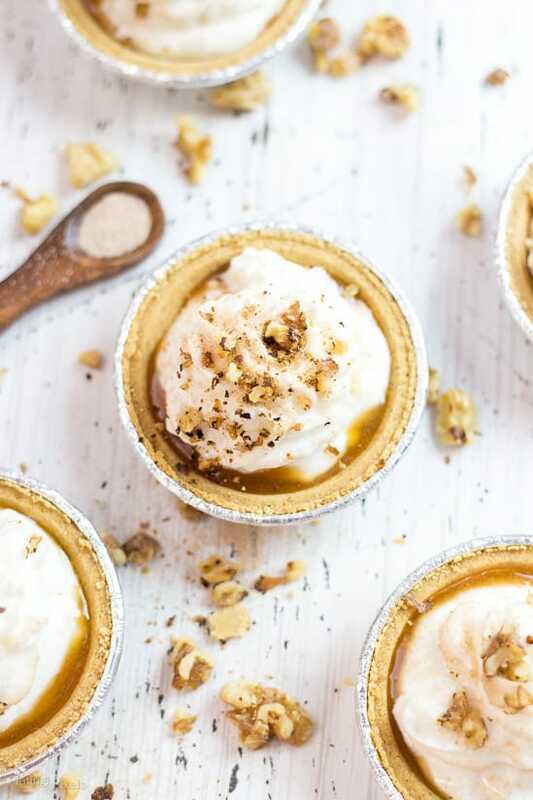 Quick No-Bake Mini Caramel Apple Pie “Cheesecakes”. Easy fall dessert made with caramel apple yogurt, whipped cream, graham cracker crust, cinnamon sugar and toasted walnuts. 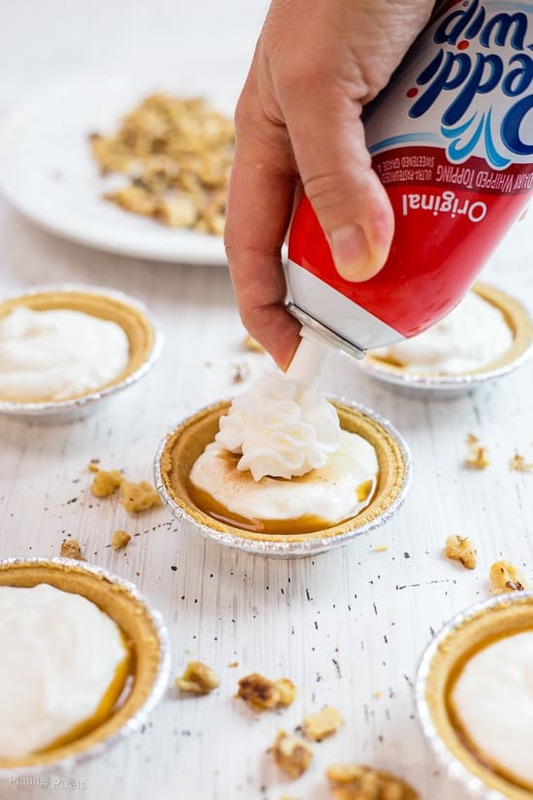 Within this recipe post you’ll learn how to make easy mini cheesecake pies; with just a few ingredients, no baking and easy cleanup. 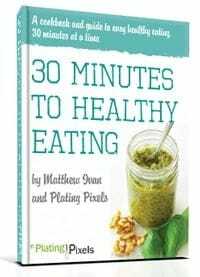 Plus you’ll learn why you should always toast nuts. Gorgeous and delicious. 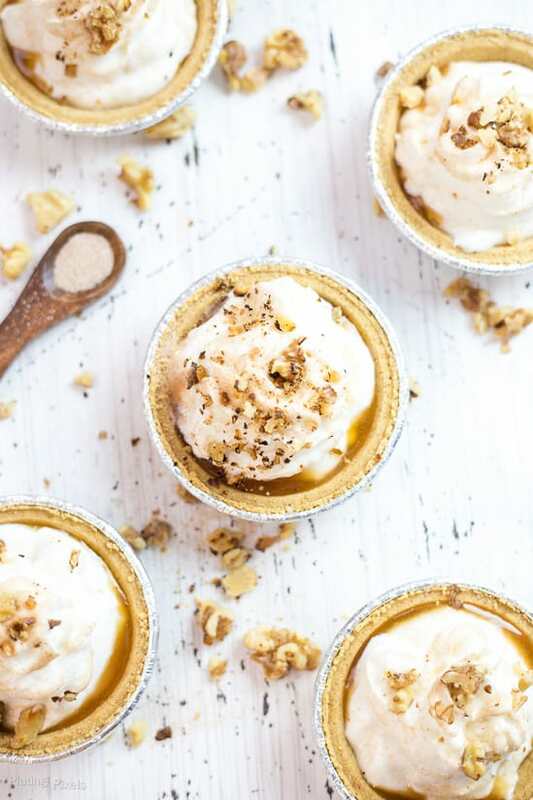 Yes this is a food blog and yes I’m talking about food, specifically No-Bake Mini Caramel Apple Pie Cheesecakes. This was a difficult name to come up with; trying to distill the essence and flavor of the recipe. Luckily for you, making these pies is the exact opposite: effortless. Sometime things just work out unexpectedly wonderful. These mini caramel apple pies assemble in a flash. The food photography for this recipe just worked as well. Gorgeous…did I mention that? It was important to capture the elegant simplicity and make you want to reach into the screen and grab one. Technology isn’t quite there yet, so you’ll have to make them yourself. First toast the walnuts. To speed up the recipe you could skip this step and just use raw walnuts; but toasted nuts have so much more flavor. Try this moist Pumpkin Bread with Toasted Pecan Maple Glaze for even more toasted nuts; plus it’s perfect for fall breakfasts. After the walnuts are ready it’s on to assembling. 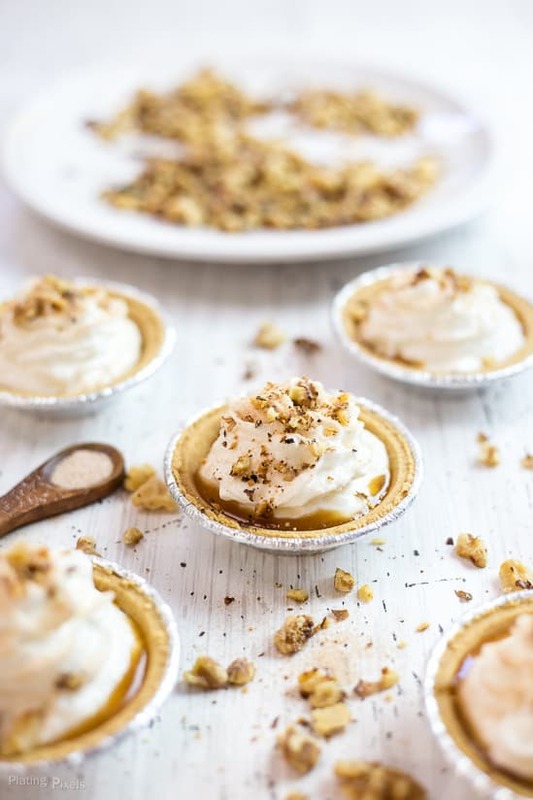 Hopefully the food photography has sold you one this recipe, because words cannot describe the sweet, tangy, creamy and apple pie-y amazingness of these. With just a few ingredients you can have a simple but oh so decadent dessert; plus it’s healthier and no pans or cleanup needed. These are perfect for a dessert, breakfast or snack. Bring to a party (if you’d dare share these) and impress with this fun and creative Caramel Apple Pie Cheesecake recipe. If a dish includes nuts (specifically macadamia, walnuts, pecans or almonds) I suggest toasting them, even if the recipe doesn’t call for it. You’ll get much richer flavor with a subtle smokiness. Dormant flavors and oils are released when heated, plus you get those beautiful golden brown spots on them. Both savory dishes and sweet desserts benefit from this. Still need convincing? This article from WonderHowTo goes into more detail. Toasting nuts is very simple and can be done in a pan on the stove or in the oven, but I prefer the quickness and hand-on way of pan toasting. As soon as the nuts are perfectly toasted, remove them from the the pan. Place on a plate in a single layer to cool. Otherwise, the oils in the nuts will continue to cook and burn. Flavor profiles: Rich, sweet, slightly tangy, and cinnamon spiced. Texture: Creamy yogurt filling over a crunchy graham cracker pie crust, topped with crunch of toasted walnuts. Dietary Options/Substitutions: Omit walnuts if allergic to nuts. 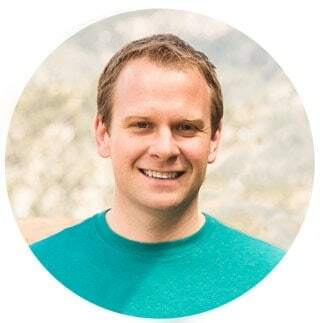 Are you following me on Pinterest, Facebook, Twitter and Instagram? Also sign up for our newsletter to get all our recipes and cooking tips. Easy mini cheesecakes pies made with caramel apple yogurt, whipped cream, graham cracker crust, and cinnamon sugar. Toast walnuts in a small pan over medium-high heat; 4-6 minutes, stirring constantly until slightly browned. Remove from plan and place on a plate to cool. 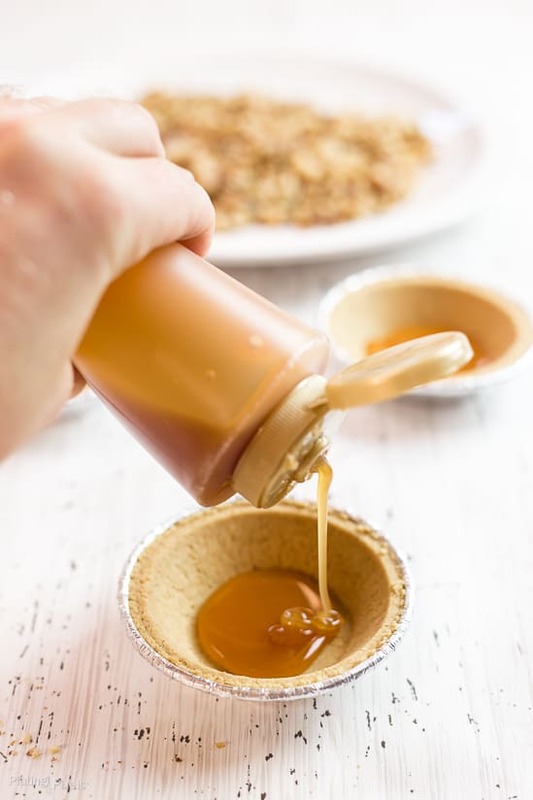 Drizzle caramel sauce in bottom of each mini pie crust to create a thin layer. Top with Caramel Apple Yogurt to fill pies. Top with desired amount of whipped cream. In a small bow combine cinnamon and sugar. Lightly sprinkle onto each prepared pie, then top with toasted walnuts. Serve immediately; leftovers can be stored covered in the fridge. Check out more easy pie recipe ideas for inspiration. How would you make this your own? It looks really good and easy to make but it says cheesecakes. Do u use cream cheese also? Thanks Janet! It’s a cheesecake inspired recipe, but a healthier alternative. It does use whipped cream and a graham cracker crust and tastes just like a cheesecake. Guess it’s the same thing a saying ‘vegetarian beef’. So simple! What a smart recipe! Just beautiful! Your lighting is so stunning. I want that kind of light in my own kitchen! Love how fun and easy these no-bake cheesecakes are to make. Yum Central! Thanks so much Steph! I don’t have the best natural light in my apartment, so I often use an extra 105 watt bulb for highlights. 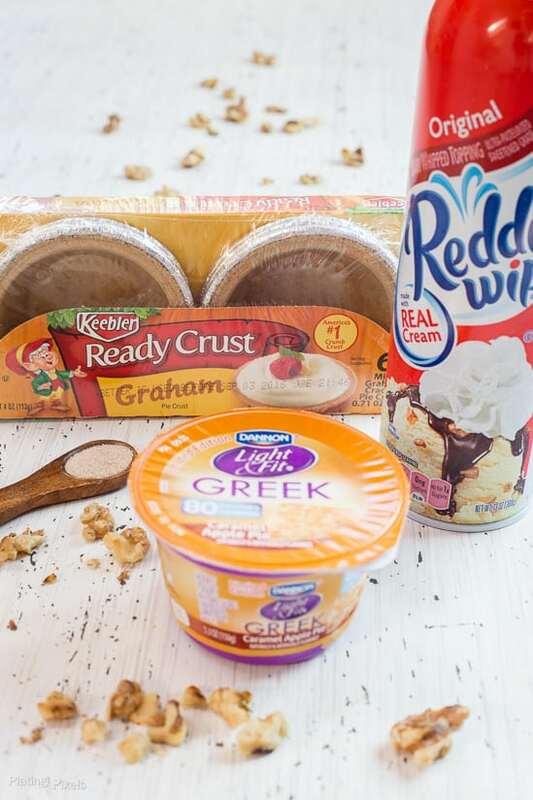 I love that the Carmel Apple Pie Yogurt makes these healthier, and it’s so great that there are virtually no pans or bowls to clean up at all! Such snap to make! What an easy fall dessert, and so pretty, too! There’s so much flavor in the yogurt. Simple to make and enjoy. Thanks Shelley! I always like finding simple, easy recipes my 3 and 5 year olds can make – this looks like a fun kitchen project we can enjoy together! Great Kimberly! That would be fun and perfect for a child that age. I love this idea for mini personal desserts! I love miniature desserts! Cute! The photography absolutely sold me, I’m just super sad I *can’t* reach through the screen and eat one right now! Guess I know what I need to pick up next time, and great tip on toasting the walnuts! Thanks so much Nicole! They’re super easy to make, so that’s a plus since you can’t grab them from the blog. Glad you like the tips! Haha mission accomplished then. Thanks Meagan! WOW those look so incredibly good – and so easy. I love the idea of using yogurt, too. So much healthier (well ya know except for the caramel and all). Gorgeous! Haha I was careful to write ‘healthier’. Thanks so much Michelle! They sure are. Thanks Christine! I think you should! Thanks Kate! All your recipes are so amazing! And this one is also super quick and easy, something I shouldn’t be able to do with dessert….I’ll just make it for myself! These caramel apple pie cheesecakes look delish. I love the presentation! Those look delicious! I love making things in the mini pie crusts! It’s so fun right?! Thanks Lindsey!